The easiest customer to keep, is the one you already have! Book now for a 5 day short course, complete by June 30th and CITB members receive a $100 discount. 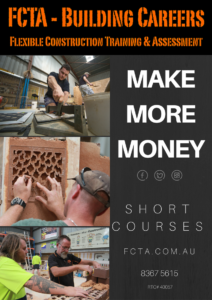 Call us on 8367 5615 or email admin@fcta.com.au to discuss your training needs. Our courses cover basic to advanced tiling, introductory bricklaying, traditional solid plastering and more. Click this link to download our course brochure. FCTA – Building Careers flexible approach to training means we can adapt projects to make them relevant to your particular needs. For example if a tiler wanted to be able to install cornices to bathrooms that have been tiled to the ceiling, we can create a project to match. Please note, this promotion excludes our 3 & 4 day courses as well as the introduction to plasterboard course – due to the high cost of materials.